NASA astronaut Anne McClain and Canadian astronaut David Saint-Jacques completed the last in a series of three spacewalks. NASA astronaut Anne McClain (left) and Canadian Space Agency astronaut David Saint-Jacques (right) conducted a 6.5-hour spacewalk on April 8, 2019. NASA astronaut Anne McClain and Canadian astronaut David Saint-Jacques spent six hours and 29 minutes completing several repairs and upgrade tasks on the space station. Internet cable work at the U.S. laboratory caused some problems for the duo. The astronauts had to remove a micrometeroid orbital debris shield to access some cabling to upgrade connectivity for experiments on the space station. One of the fasteners on the shield, however, refused to loosen. Eventually, astronaut Jeanette Epps — who was walking the astronauts through the spacewalk step by step from NASA's mission control in Houston — suggested Saint-Jacques grab a pry bar. He carefully inserted it under the panel, verifying first that he was in the right position before pushing. "I feel some movement," said Saint-Jacques, who was the first Canadian Space Agency astronaut to venture outside the ISS in 12 years. The two astronauts carefully jimmied the pry bar back and forth underneath the shield, eventually pulling the panel loose. "Got it!" Saint-Jacques exclaimed. He and McClain exchanged a quick high-five before finishing the installation. Epps reported that the first connectivity tests worked perfectly. "That's great news," said McClain, who was on her second spacewalk. The panel, unfortunately, then refused to go back in, forcing the astronauts to remove and reinstall a nearby handlebar to squeeze the panel into position. With that task finished, McClain secured the panel with long-duration tie-down tethers before the astronauts moved on to their next task. Canadian astronaut David Saint-Jacques gathers equipment to install experiment-support plugs on the outside of the International Space Station on April 8, 2019. This was the Canadian Space Agency's first spacewalk since 2007 and the 216th spacewalk overall in support of ISS maintenance and operations. This spacewalk, the 216th performed by astronauts on the space station, began half an hour early, at 7:31 a.m. EDT (1131 GMT), when McClain and Saint-Jacques switched their suits to internal power. 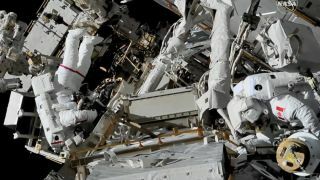 Their duties included a pickup task from a March 22 spacewalk that McClain and Expedition 59 crewmate, NASA's Nick Hague, did to install new lithium-ion batteries. One of the batteries and its charge-discharge plate was not charging properly, so McClain and Saint-Jacques moved a new adapter panel into place for future robotics work to finish the installation. After dealing with the cable and stubborn debris shield, the astronauts worked in support of the Canadian robotic arm, Canadarm2, which routinely lifts equipment and assists with repairs on the space station. The arm is working well, but the astronauts proactively installed jumper cables to add a backup power supply for the 18-year-old robotic helper. The astronauts next split up to finish up the last set of tasks on the docket for this spacewalk. Saint-Jacques was assigned to install special support plugs (more technically known as trunnion slip-off protectors) at the European Columbus module, but did not recognize the configuration of the parts in front of him on the site. Mission control staff decided to hold off on the installation for today and instead asked Saint-Jacques to take some pictures for future investigations. When these plugs are eventually installed, they will hold future experiments mounted on an upcoming external payload facility, Bartolomeo, which will arrive at the space station in 2020. Bartolomeo is named after the younger brother of Christopher Columbus, the famous European explorer for whom the Columbus module is named. McClain, meanwhile, continued the Canadarm2 cabling work. She moved around different worksites on the space station S0 Truss, trying to squeeze her bulky spacesuit in between the metal struts without disturbing any connectors. "Anne, it looks like you know where you're going," Epps joked, before suggesting McClain try going into her next site head-first. "I tried that a few times," McClain responded, saying a couple of brackets were in the way. Epps said mission control was ready with some alternate routes, if needed. "I'll try this again," McClain said, before carefully moving inside the truss to do more cabling work on Canadarm2. McClain next did some quick work-ahead tasks on the Canadarm2 cabling, while Saint-Jacques (having finished cleanup at his last worksite) relaxed for a few minutes by the Quest airlock. After McClain joined him, the duo entered the airlock and the spacewalk officially finished at 2 p.m. EDT (1600 GMT). The next spacewalk is scheduled for May 29, by Russian cosmonauts by Oleg Kononenko and Alexey Ovchinin. American astronaut Anne McClain (red stripes) and Canadian astronaut David Saint-Jacques work together on April 8, 2019, to remove and reinstall balky meteoroid/orbital debris shielding on the International Space Station, in order to install new Internet cabling for experiments. Williams spoke with Saint-Jacques on Saturday and provided him with some last-minute tips, such as how to move along the space station truss using his fingertips, Williams told Space.com in a phone interview from the CSA headquarters near Montreal. "Talking to David, one of the big differences in the shuttle program was we would keep training up until the time we were going into quarantine," Williams said. On space station missions, the crews are generically crewed in spacewalk skills and given their specific tasks later. American astronaut Anne McClain moves between worksite locations on the S0 Truss of the International Space Station as she installs cabling for a backup power supply for robotic arm Canadarm2. Williams added that his first two spacewalks were task-specific, while the last one was more space-station style after former NASA astronaut Rick Mastracchio got a hole in his spacesuit glove on a previous spacewalk; mission control modified the tasks on Williams' last spacewalk to adapt to the situation. Williams pointed out that, coincidentally, when the airlock was depressurized and repressurized, the Canadian flag on Saint-Jacques' suit was visible in the window facing the interior of the space station. He said it gave "an amazing sense of pride," and made him think about the future of the Canadian space program. Canada recently was the first international partner to sign on to NASA's lunar Gateway program, a space station that is supposed to be operating in orbit around the moon in the 2020s. Canada plans to build a robotic arm called Canadarm3 to support that project, inspired by the nation's success at the International Space Station. Today's spacewalk "makes you wonder about the future," he said, adding it makes him think about where the next generation of Canadian astronauts are right now and how far along they are in their schooling.